This article is about the modern administrative region of Greece. For the historical region, see Attica. For the former prefecture, see Attica Prefecture. For other uses, see Attica (disambiguation). Located on the eastern edge of Central Greece, Attica covers about 3,808 square kilometers. In addition to Athens, it contains within its area the cities of Eleusis, Megara, Laurium, and Marathon, as well as a small part of the Peloponnese peninsula and the islands of Salamis, Aegina, Angistri, Poros, Hydra, Spetses, Kythira, and Antikythera. About 3,750,000 people live in the region, of whom more than 95% are inhabitants of the Athens metropolitan area. 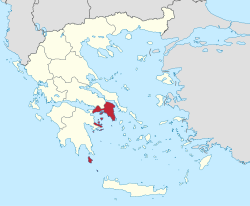 The region was established in the 1987 administrative reform, and until 2010 it comprised the 4 prefectures of Athens, East Attica, Piraeus and West Attica. With the 2010 Kallikratis plan, the region's powers and authority were completely redefined and extended. Since 1 January 2011, the region represents the second-level local administration. While being supervised by the Decentralized Administration of Attica, it is now an independent self-governing body with powers and a budget comparable to the former prefectures. The region's governor is Rena Dourou (SYRIZA), who on 1 September 2014 succeeded Giannis Sgouros following the 2014 local elections. The Attica region consists of five electoral districts: Athens A, Athens B, Piraeus A, Piraeus B and Attica. Attica is the only region in Greece with a GDP per capita higher than the average of the European Union. Despite that, the unemployment rate stood at 21.6% in 2017. ^ "Resident Population of Greece - revised". Hellenic Statistical Authority. 30 November 2016. This page was last edited on 12 April 2019, at 16:34 (UTC).